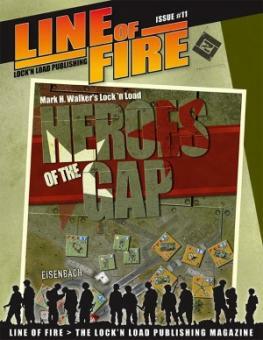 Line of Fire #11 contains 60 pages of content with tactics articles for Space Infantry and Heroes of the Gap; in-depth battle reports on scenarios from White Star Rising, Island War Deluxe and “Hot War” from the World at War: SADF Chapter. The Lock ‘n Load National Capabilities Chart gets updated with units from Heroes of the Gap. An interview with Peter Bogdasarian provides insights into Tank on Tank East Front. There’s a gamer’s impression of Warparty, previews of White Star Rising: Operation Cobra and Heroes of the Pacific, riveting reviews of Worthington Games’ Boots on the Ground and Warlord Games’ Hail Caesar, plus The Cardboard Curmudgeon strikes again, and more.